Last night I arrived home to find a bottle of Francis Ford Coppola Ivory Label Cabernet Sauvignon breathing on the counter. I’ve been curious to try the Coppola wines, wondering if Coppola’s star power was the main selling point or if there is actually something there. Since they’re not particularly cheap (averaging $15-$20) I’ve always opted for an alternative. But since Amy did the grocery shopping, price is no object (thank goodness the really expensive stuff is locked in a glass case!). So, after tasting the wine independently (that is, while trying to get the kids ready for bed and not actually having time to make eye contact), Amy and I convened a meeting of the San Diego Grocery Wine Society. Our verdict: undecided (although we had no trouble finishing the bottle). The Coppola cab’s flavors were a bit unexpected. Have you tried it? 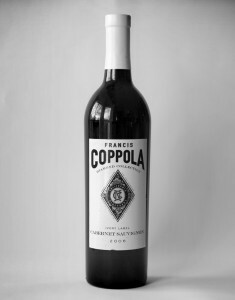 What’re your thoughts on Coppola’s wine’s overall? Vote in the poll, check the results and sound off in the comments! I was a little torn on this one… while these are worth tasting, there are also better wines out there for this price.